Previous post covering the first two classes. 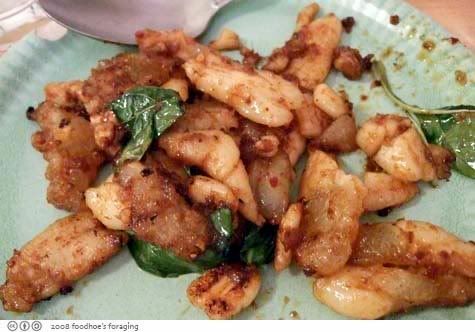 Our third class was ambitious with five dishes, although we ended up doing six as we made two versions of the garlic-peppered dishes, shrimp and pork. 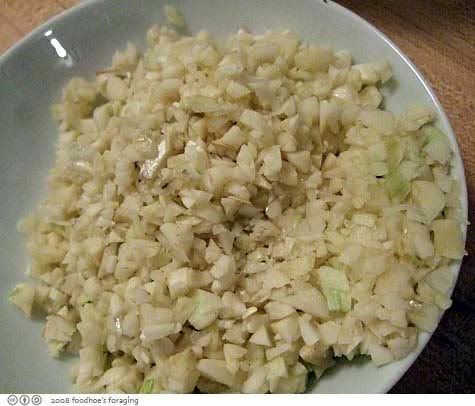 This class required another big pile of garlic, at least 7 whole heads were chopped coarsely. Kasma said coarse is better so the garlic doesn’t burn. I was over at the mucky seafood cleaning station but heard people exclaiming about the amount of garlic they were chopping. 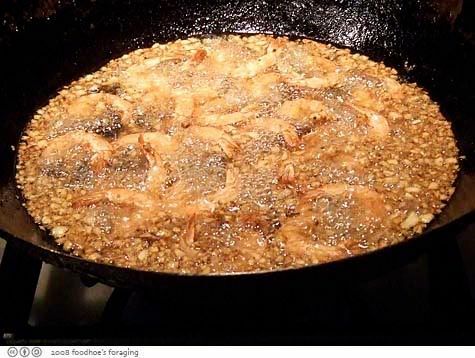 Here are the shrimp frying in the wok. 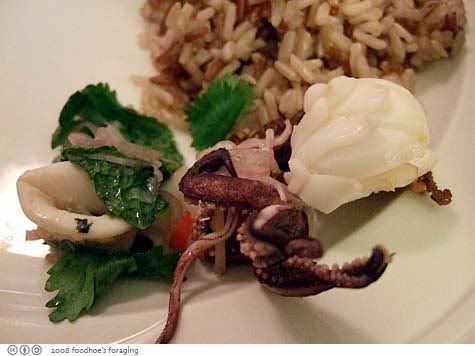 We cooked and ate them whole, Kasma reminded us that the shells are a really good source of calcium! This cooked very quickly and filled the room with an incredible aroma. 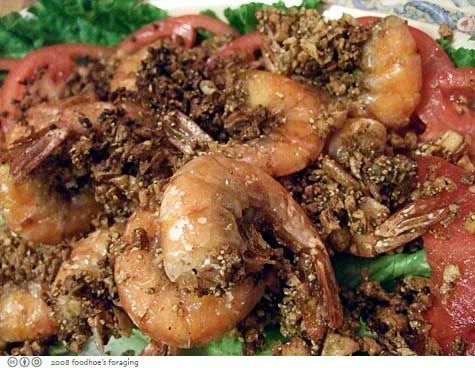 Garlic-Peppered Shrimp (Gkoong Tawd Gkratiem Priktai). Served over lettuce with tomato slices. We fell on this dish like starving wolverines, as we all know that fried food must be eaten right away. Besides lots of garlic, this dish iincluded a fair amount of black pepper which was the source of heat in the dish. This was not a few grinds with the pepper grinder, it was a big handful of peppercorns ground up in the spice mill. Kasma likes her heat! 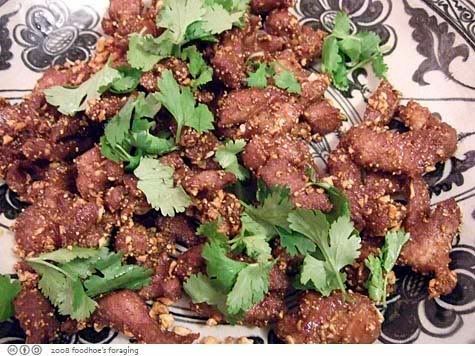 This is the Garlic Pepper Pork, which required a much longer cooking time. 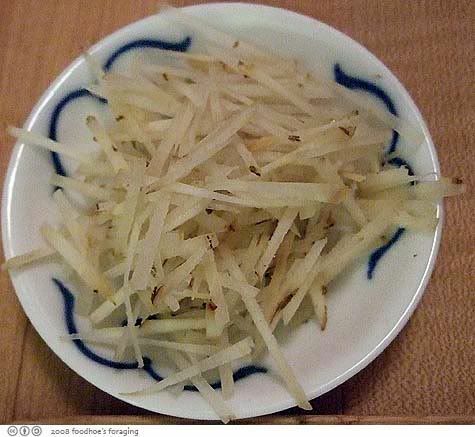 She said to use a fatty cut like the shoulder, because it needs to be cooked at a high temperature for a long enough time to render out the fat and make it crispy. 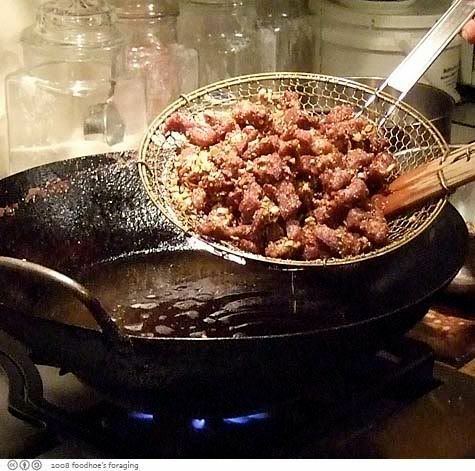 Otherwise the meat can taste greasy. It was crispy for sure, and chewy but not dry. You can see each piece is coated with garlic and black pepper, we got to eat both dishes as they finished cooking. I’m sure that we were all fire breathing dragons the next day. Now this is some crazy liquid volcanic lava… thai chili peppers and garlic mashed down in the mortar and pestle. This was a huge handful of garlic and an equal amount of those incendiary chilies. Like I said hot lava… It was mixed in with fresh lime juice, fish sauce and some palm sugar. Kasma had us all dip into the cauldron of liquid fire as she added different ingredients so that we could see how each element like sugar (sweet) and the fish sauce (salt) changes how our tastebuds react to the heat. She has written an excellent article on the balancing of flavors that can be found on her website here. Julienned galangal that didn’t pass Kasma’s Q/A, and each piece needed to be cut in half because this was going into a salad to be eaten raw. 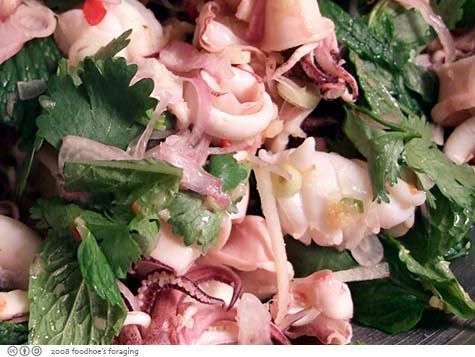 This is the Hot and Sour Calamari Salad (Yam Bplah Meuk) liberally dosed with the above mentioned liquid fire sauce. We learned how to clean whole calamari and also how to score the larger calamari flesh with the diamond pattern that curls making it look very professional. 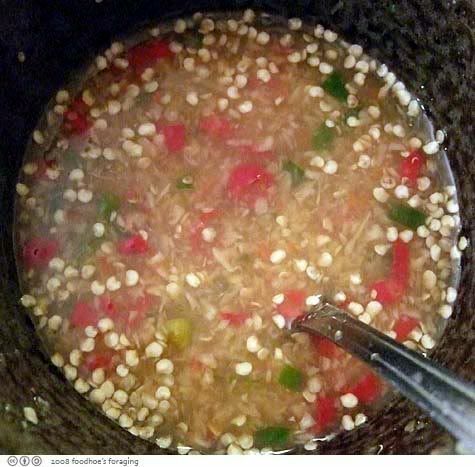 The flavors were fantastic, an assault on your senses with crisp fresh herbal flavors from the cilantro, mint, galangal and shallot, and the pungent incendiary dressing bursting with heat from garlic, fresh chili peppers and lime juice. This dish made my tastebuds weep. Cooking with Kasma is not for the faint hearted! 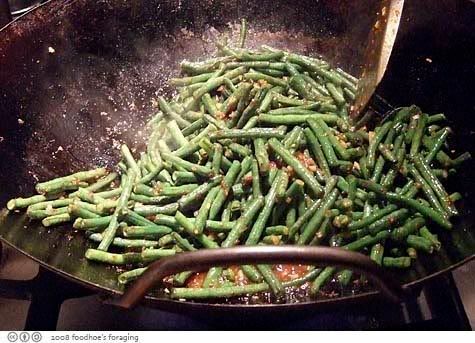 Stir-Fried Long Beans with Roasted Chilli Sauce and Thai Basil (Tua Yao Pad Prik Pow). This was the only mild dish of the evening. The roasted chili paste is sweet and smokey and had just about the right amount of heat for me. Fortunately we had sticky rice for dessert, an excellent way to fill up. While we worked on the other fried dishes, Kasma setup three different types of rice to steam, a mixture of jasmine and brown rice, black sticky rice and regular sticky rice that was cooked in a traditional bamboo basket. 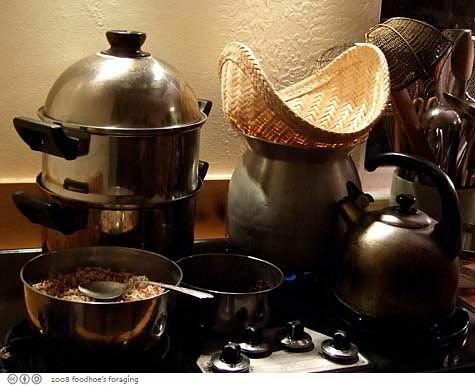 She had been soaking the brown rice for an entire day and the rest of them for at least a few hours. 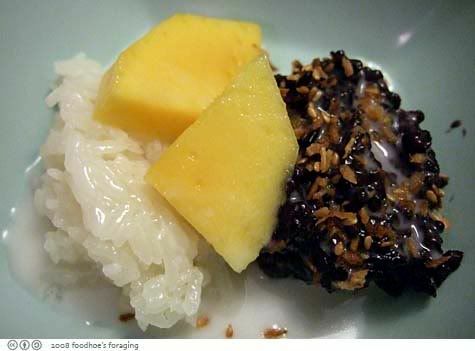 The desserts were delicious, Coconut flavored sticky rice with Mangoes and Black Sticky Rice with Toasted Coconut and Sesame Seeds, the toasted things added an amazing depth of flavor to the dish and definitely should not be skipped! Sticky rice is notorious for continuing to expand long after you finish eating, so I tried to limit myself to just one serving. read about the final class covering classic Thai noodle dishes here. I recently had sticky rice w. mango and love it….must try w. toasted coconut + sesames seeds. 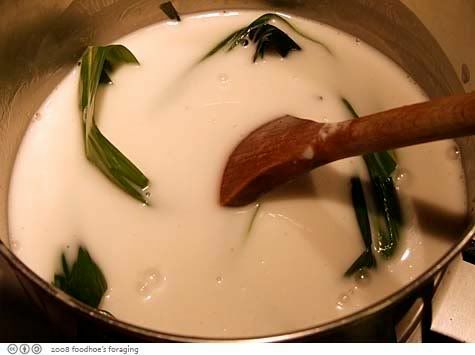 You must be learning a great deal in that class ~ the sauce in the mortar + pestle looks great! I see you finally learned how to make your sticky rice pudding dessert. Everything looks good, you guys must have feasted during class. Where did she get the pandan leaves? They used it in Vietnam and I didn’t realize you could get them here? It’s good for scented the rice, too. single guy, yes I finally did – yipeee! Here’s a link to the list of thai markets on her website . Lots of good shops on International in Oakland! A big pile of garlic would give me pleasant foodie dreams. Wow, what heaven! And as for the sticky rice…oh yes how they expand. I usually eat only one serving each at breakfast and dinner. Oooh, shrimp plus big piles of garlic plus lots of pepper? I’m in love already! 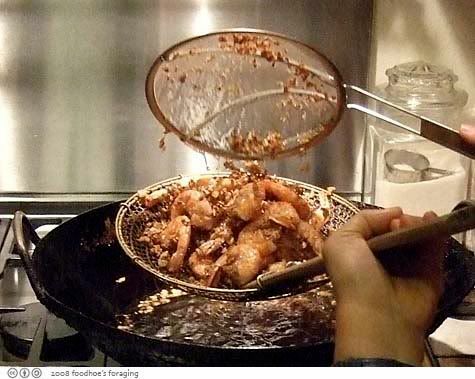 I didn’t see recipes on this post, so I’m off googling “garlic pepper shrimp”. .-= Valerie@CookingSharp´s last blog ..Grape Nut Bread Vintage Recipe =-.